March has been a busy month, bookwise. We announce the publication of four new books: three volumes of the Complete Works of Sangharakshita, and Mindful Emotion by Drs Paramabandhu Groves and Jed Shamel. 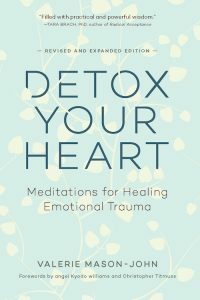 We are also carrying a new edition of Detox Your Heart by Valerie Mason-John (Vimalasara), published by Wisdom Publications. 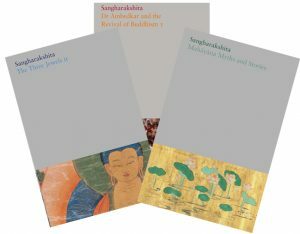 We announce the release of three new volumes of the Complete Works of Sangharakshita, in time for celebrations around the 50th anniversary of the founding of Triratna. Fifty years ago, Sangharakshita founded Triratna, a spiritual community bringing Buddhism as a living tradition from the East to the West. Windhorse Publications is the main publisher of this prolific author, and the main publisher for the Triratna Buddhist Community. You can subscribe to his Complete Works online. The Three Jewels II, which contains What is the Dharma? and two previously out of print titles: What is the Sangha? and Who is the Buddha? This volume also contains new endnotes, which take the reader to the original sources of the many teachings given in these commentaries, i.e. to the Buddha’s teachings in the Pali Canon and Mahayana sutras. Mahayana Myths and Stories, which brings together the commentaries on the White Lotus Sutra, the Sutra of Golden Light and the Vimalakīrti-nirdeśa. They are now available from our website. You may also find them at Triratna Centre bookshops. 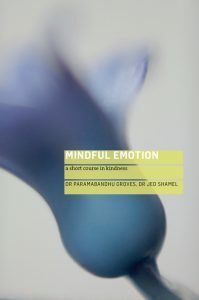 We have also just released Mindful Emotion: A Short Course in Kindness by Drs Paramabandhu Groves and Jed Shamel. Amid the recent explosion of secular mindfulness, the authors’ aim is to re-emphasize the importance of the heart, introducing the reader to a variety of ways of approaching kindness-based meditation, as well as to how to put kindness into practice in daily life. Also, we’re carrying a new edition of Detox Your He art by Valerie Mason-John (Vimalasara), published by Wisdom Publications, and endorsed by Tara Brach and Sharon Salzberg.